"Embracing the Trinity," an exhibition of pigmented-ink photographic prints by Christine Triebert filled the walls of the Vermont Center for Photography during the month of June. Walking into the gallery and making a round of the pictures was not unlike watching Jean Cocteau's classic surrealist film Beauty and the Beast (1946). Both visionary and myth-like qualities were apparent in the specifically chosen and intricately composed subjects. The thirteen symbolic figures depicted in like-sized prints were like a personal Tarot deck, a pantheon of Earth-Saints or the characters in a "Lessons of Life" parable. The artist has revealed her reverence for the Judeo-Christian religious tradition simultaneously with a respect for pagan beliefs and symbols. This combination of influences is balanced or "grounded" in a personal knowledge of places in Nature. Overall, the show was a sort of "passage" for Ms. Triebert, as she has stated in a piece of writing that was displayed with the photographs. The impetus for the series was the separate deaths of three friends during a short period of time, and the artist's need to process that experience. The exhibition was also a passage for viewers who were lucky enough to stroll through Triebert's lexicon of symbolic devas. 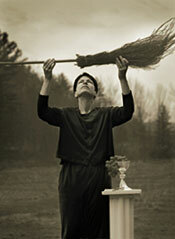 Greeting the viewer on entering was a self-portrait of the photographer as one might expect to see her, in black, semi-silhouetted, with her arms raised above her, holding her Wiccan broom to the sky. To her side is a classic Greek pedestal upon which is a bunch of grapes. Close by, two small photos entitled "Transformation" and "Memorial II", were precious in different manners. 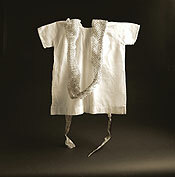 In "Transformation," a small white blouse that seemed like a Mexican peasant blouse, was draped gently, scarf-like, with a large molted snakeskin. The blouse linen and the dried, scaly reptile skin are light and delicate in texture and thickness, though different, so different. They capture the thematic symbology of the entire show. The blouse is Life: its loves, labors, stories and dreams. The snake's hide is death, not as finality but as transformation, as cycle, as rebirth. "Memorial II" seemed from a fable. 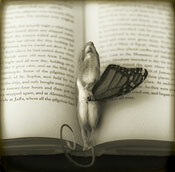 We see an open book up close, partially out of focus. In the cleft between the spread pages is a mouse. It is dead and in its tiny, bony mouse hand is a relatively large butterfly wing, held like a symbolic object in the hand of a mummified Egyptian priest. The small rodent head is laid back in repose; the camera lens focus has landed on the little teeth, which sustained it in life. They are just bones now. The fable implied might be in the page's text, just out of focus. Some of the photos were presented as mixed-media works, with the stress on the subject matter. The show included two triptychs which invoked fifteenth century Christian panel painting. "Triptych I" was three small (12"x5"), Gothic arch-shaped photographs of the same female figure in different poses. At first she is standing, her back towards us, a large fish below; centrally, she faces us, her head in a birdcage. In the right-hand panel we see her from the side; her drapery has been let down from her shoulder, revealing her breast. She gazes at her reflection in a hand-held mirror. The artist's statement was at the back of the gallery near the first of the thirteen large prints, which proceeded clockwise and filled the rest of the room. Each of these figurative pieces was a specifically composed narrative. Many of the subjects were draped in cloth, like Greek or Roman characters. This visual element established a "mythical" or classical setting in the mind of the viewer. Next, the character depicted had a prop or object(s) symbolizing adverse concepts. Finally, a place in Nature was selected as setting and background, adding, also, another symbolic element. "We Court the Serpent and the Lamb" is an exquisitely organized combination of visual elements. A dark-haired woman in white stands with a lamb at her feet. 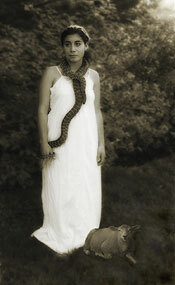 A large, beautifully patterned serpent hangs from her neck and reaches down to her hand, which caresses its languid form. The woman's dark eyes gaze back at the viewer. The lamb reclining at her feet is one with her and meets the viewer's gaze also. All seems natural and uncontrived in spite of the obvious difficulty in arranging such living elements. The image is strong and unforgettable. In "Brother of Mercy and the Sword," a barefoot and shirtless man in black pants holds a large knife in one hand and eggs in the other. In "Mother of Hope and Sorrow," a sitting woman in dark drapery holds in one hand a deceased bird wrapped in a death shroud and in the other a large daisy-like flower. In "Catching the Light and Holding the Shadow," a woman in a Gatsby-ish hat is on the beach. One arm reaches aloft holding a net on a long pole to catch the light; a pail is held low by the other hand to hold the shadow. In "The Hero is Fool and Sage," we are given many narrative details, and the picture is much like a Tarot card. 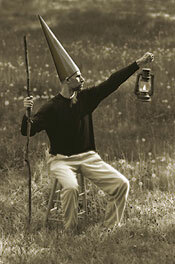 A sitting man holds a staff in his left hand and wears a large cone hat. Is he fool or wizard? His expression is both serious and ironic as he gazes at the light emanating from the lantern held by his other outstretched arm. This great and silly wise man is mystically empowered by the flowers and foliage surrounding him in the field which, visually, have a fluorescent, celestial quality. 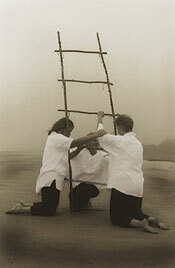 The photography techniques used by Triebert in this case create a surrealist effect so strong that the word hallucinatory would not be out of place. In fact, many of the landscape backgrounds are so surreal they seem as weird and hallucinatory in effect as simple tricks involving focus, slow motion, and off-camera fans used by Jean Cocteau in the landmark surrealist film Beauty and the Beast, which one should rent after seeing this photography exhibit. The show was very film-like, in fact; each character a new scene, a new setting. In one piece, Triebert showed a personal familiarity with the point where field meets forest. It is there, at the field's edge, that so much life is found. 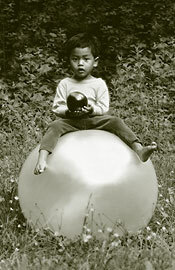 It is there that she photographed a young Asian boy astride a large white orb. His mouth shyly open, he gazes into the camera while holding a black orb in his hands. His legs stretch over the slightly glowing sphere. She entitled the picture "The Child is Wonder and Wisdom." Through this group of symbolic photographic icons, Christine Triebert makes the viewer into a child again, to be filled with wonder and wisdom. Editor's Note: Christine Triebert is a member of the Rock River Artists collective in the Williamsville, Vermont area who open their home studios to the public for one weekend each summer--this year it's July 17 and 18. Stop by Triebert's studio to see her original prints and cards. For details on the 12th annual Rock River Artists Tour, please call (802) 348-7440 or 348-7865, or e-mail carol@svcable.net.